Dustin is the owner of this elegant and aggressive M550i xDrive, he stated that the reason he got the car was because it checked all the boxes for him. Those boxes being power, technology, AWD, turbos, and comfort. 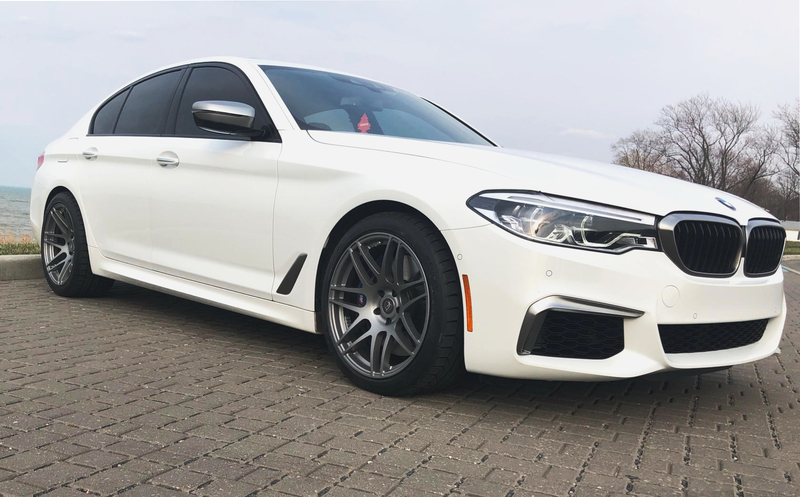 This is his second BMW and he claims that as long as BMW continues to create fun cars, such as the M550, he see’s no reason to not buy them. However, even a BMW loyalist will admit it’s no fun driving a car that looks no different than any other M550i. That is why Dustin’s first mod on his car was a fresh set of Gunmetal Forgestar F14 wheels (19×9.5 front, 19×10 rear) to help him stand out from stock G30s. The Forgestar F14 is a very simple and clean wheel that looks pretty much great on everything. Forgestar F14’s are rotary forged wheels, these wheels are made using a special process. This process is done by using three different hydraulic wheels to turn the wheels over a special mandrel which then creates the form and shape of the wheel. This pressure actually changes the the mechanical properties of the wheel making it stronger, almost to the strength of a forged wheel, and makes the wheel about fifteen percent lighter than other cast wheels. The real kicker here, and one of the reasons we at ModBargains like Forgestar so much, is that these wheels are completely customizable fitment-wise. This means that you can get widths and offsets that are guaranteed by Forgestar to fit your vehicle perfectly based on your request. They also offer a lifetime structural warranty so you can be confident that you’re getting a quality wheel. Dustin has many plans his M550 in the future with his main focus on the power, suspension, drivability, and lastly little cosmetic touches here and there. You can bet that we will be here to help him with future modifications and he’s so far been overall very pleased with his purchase of both the car and the Forgestar F14’s. If you are looking to pick up a set of wheels for your car anytime soon make sure to visit our website at Modbargains.com where we have tons of different wheel styles and brands. If you have questions about finding wheels for your vehicle we have Mod Experts who are very knowledgeable in finding the perfect wheels for you, like our Mod Expert Elliot who helped Dustin with his wheels. You can reach him at [email protected] or by phone at (714) 582-3330 x8011. To reach our general sales department you can call (714)582-3330 or email [email protected]. Customer Spotlight: Standing out in the Crowd – Hyun K.